Sapphire，the Blue Planet. Humans, Elves, Orcs, Dragons and other races co-exist on this fertile world. However, to expand the power of the Nether Realm, Hades began to spread plague in Hurricane Highlands. As a result almost all dragon eggs were infected. Hades also spread false news to the Dragons that 'the World Tree in Human territory can cleanse the plague'in order to incite war between Dragons and Humans. Dragon King Ulysses let his forces into the heart of Sapphire, promising eternal life and threatening destruction, Ulysses forced the Orcs to ally with him. Freeman Kingdom and Palmer Kingdom of the Human race allied to resist the invasion. Their friend, Elf King Harington joined the Human faction. 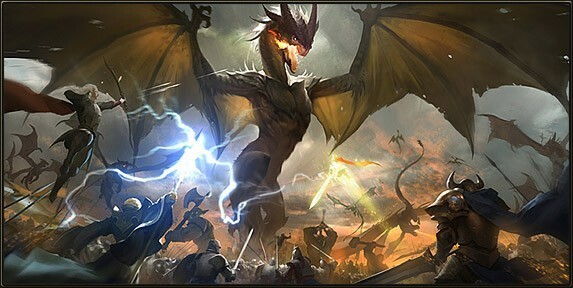 Invoving 5 kingdoms, 4 races and 2 factions, the Chaos Wars began.In the initial phases of the war, the Dragon faction had absolute advantage, the Humans retreated all the way to the South of the Wrathul Chasms. For reasons unknown, the evil Hades let news slip to Freeman the 1st of a Relic that could turn the tide of the battle——“Eternal Crown”. The two Kings decided to lead a elite expedition force in search of the Eternal Crown.In the Nether Shrine, they found the Relic. Palmer sensed the lurking evil in the crown and warned Freeman, but Freeman only noticed the great power held within the crown. Not heeding counsel, Freeman lifted the crown unto his head. A great surge of dark power flooded his body, rendering him unconscious. When Freeman woke up, he found to his utter horror, the whole expedition team as well as his friend Palmer, dead at his feet. Returning with the crown, Freeman presented himself as sole survivor of a Dragon ambush and made himself Regent to Palmer Kingdom using a forged will. With the situation critical, second in command of the Palmer Kingdom——Odin had no time to question the validity of the will.With power of the Eternal Crown, Freeman mounted counter attacks, reclaiming lost land bit by bit. But with his seemingly invincible power came a great price. Freeman was gradually corrupted by the crown, becoming cruel, cold and tyrannical.Freeman slaughtered captives and refugees to demonstrate his power, even his own man who committed minor mistakes were executed. Young Prince Lucas detected the change in his father early on and tried to intervene, but to no avail. Not until Lucas's sister, Hela——best mage in Human history severed ties with their father and left Astral City in fury did Lucas realize how corrupted his father was. Faced with fierce resistance from the Humans, Ulysses started to sow dissent between Humans and Elves. He sent a team disguised as Humans and attacked the Elf's sanctuary the Lunar Shrine, looting resources back to the Human base. Ulysses bribed the Human Commander who denied all allegations. Freeman's arrogant attitude made matters worse. Elf King realized Freeman can no longer be trusted and immediately ended the alliance, pulling his troops west away from the war. The Spirit of Palmer told Odin his misfortune in the Nether Shrine. Enraged, Odin removed his army from the alliance as well, heading east. Corrupted by power and no longer sane, Freeman declared war on the Elves and Palmer Kingdom. He fought on both Eastern and Western front in the“War of Suppression”on the Howling Plain. Lucas knew then that his father threatens the fate of the world. Just when Freeman was about to execute all captives, Lucas ran one of his sword into his father's back, pinning him to the ground. With the other sword, Lucas cleaved Freeman's head from body. As the crown fell to the ground, shrill cry filled the sky. Thus fell the Dark Tyrant. Lucas's twin swords came to be known as"King's Bane"and"Fatherslayer". After the battle at the Howling Plain, Lucas became leader of Freeman Kingdom and re-established the alliance with the Elves and Palmer Kingdom. He also sought help from the reigning Archmage Gissing of Astral City on how to dispose of the Eternal Crown. 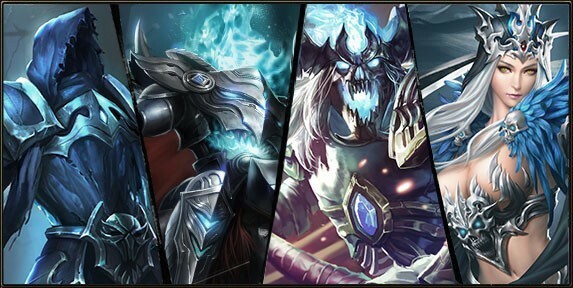 After pondering for months, the Archamage found an ancient method——Chrono Prison. Gissing used a shard of Hades's soul in the crown to forge a binding contract known as“Nether Convenant”——一should Hades cross the Nether Realm, his time would be frozen and live the day he crossed the Realm in a loop. Furious as he is, Hades had no answer to Gissing's contract and had to submit to his fate. Lucas——Freeman the 2nd was soon charged with the crime of killing his father and king and branded as traitor. Decapitated, his soul was forced to wander the world like his father. Lucas thus became the 'Headless Horseman'. The Chaos Wars lasted about a decade with the Humans edging out in the end. Both sides suffered large casualties and Hades was confined to the Nether Realm. The Orcs were defeated and split into many tribes, no longer a threat to anyone. The Elves were punished for siding with Hades and were banished from their home. The Dragons split into the Silver and Black Dragons. The former was led by Lydia, the Princess of the Silver Dragons who founded the 'Silver Legion' and joined the Humans. The Black Dragons fled to the Abyss of Sin, they had a large role to play in future events.